Russian diplomacy has a well-demonstrated tendency to sow doubt in the minds of believers in international law. More disturbing, though, is Russia’s skill for flouting formal treaty obligations and escaping consequences. Since the early 2000s, Russia has issued a series of statements attacking arms control treaties, alleging violations by NATO countries and the United States, and insinuating that it views these treaties as outdated and harmful to its interests and intends to abrogate them. More recently, it has unilaterally “suspended” its compliance with several arms treaties and proceeded to violate them. These treaties have stood for decades, and they brought about a strategic balance that underpinned the “peace dividend” of the 1990s and a more peaceful European order. That process began with the signing of the Intermediate-Range Nuclear Forces treaty in 1987. The SALT I and SALT II agreements had established that successful negotiations on arms control were possible, but both treaties were more important as political signals of détente than for their actual effects. They were notably even-handed – favorable to Russia in absolute terms, but allowing the United States to avoid a tremendously costly missile buildup. The INF treaty was profoundly different – it substantially changed the nuclear balance in Europe and entailed major concessions on both sides. The beginning of the INF issue was the deployment of the RSD-10 Pioneer (SS-20 Saber) throughout the western Soviet Union and its satellites in 1976. The SS-20 was precise, mobile, and specifically designed to target NATO logistics and command infrastructure, as well as nuclear delivery forces. Intermediate-range missiles of this type were an obvious military threat, but also inherently destabilizing since their short flight times meant it would be difficult to respond to a Soviet attack without using strategic weapons based outside Europe. NATO adopted the “Dual-Track Decision” in 1979, and pledged to deploy its own modernized theater nuclear forces, as well as using diplomatic methods to seek the withdrawal of the SS-20. These forces consisted of the Pershing II, a ballistic missile directly comparable to the SS-20, and the BGM-109 Gryphon ground-launched cruise missile, deployed in England and targeted at locations in the Soviet Union. 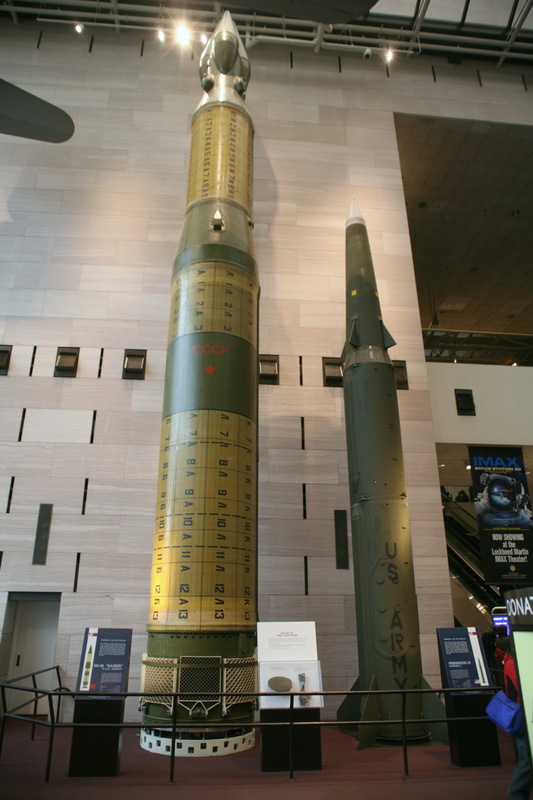 The deployment of new nuclear delivery systems gave significant ammunition to the anti-nuclear protest movement across Europe and raised the ire of several NATO countries that felt that they were now more likely to be targeted by the Soviets. Despite the political fracas, the policy worked. In part due to Gorbachev’s newfound willingness to negotiate, and in part because the NATO deployments signaled an intent to counter Russian provocations, the INF treaty was signed in 1987. It was, in essence, a way for both parties to withdraw from the standoff with their pride intact. It provided for the withdrawal and destruction of existing intermediate-range systems and put in place a permanent moratorium on the deployment of nuclear-capable delivery systems with a range between 500 and 5500 kilometers. The first sign of tension with INF came in 2005 when Russia hinted that it was considering withdrawal. Later statements emphasized that the treaty was outdated, unfair, and harmful to Russian interests. Russia pointed to American plans to emplace missile defense systems in Eastern Europe, the threat posed by Chinese nuclear forces, and the continued nuclear-sharing agreements between the U.S. and six NATO partners. Sometime afterward, Russia began development of a missile system that violated the treaty; a land-based cruise missile adapted from an earlier ship-launched system. The United States first alleged a violation of the treaty in 2014, followed immediately by a series of Russian allegations in response. INF has remained a constant issue in arms control discussions since that point; negotiations have gone nowhere, although Russia is thought to have proceeded to the deployment of the prohibited missiles. As matters stand, the treaty will be gone in sixty days – the United States has issued an ultimatum to withdraw from the treaty unless Russia addresses its alleged violations within that timeframe; something which would go utterly against the current Russian negotiating strategy. This will be a deeply counterproductive move, but it now seems inevitable. Despite the declining relevance of INF provisions, this could have been a winning issue for American diplomacy; yet the American strategy so far has been a failure even on its own merits. Until the threats to withdraw from the treaty are carried through, though, we can imagine a course of action that might produce results. Strategically, the systems allegedly in violation of INF do not offer unique capabilities. With the decreased emphasis on nuclear escalation on both sides, they are not as disruptive as comparable systems were in 1979. “Limited nuclear war” was an oxymoron then as it is now, but that fact was not yet appreciated; tactical nuclear weapons are no longer a separate level of escalation and would now be met with a strategic response. Rather, the Russian decision is central to its diplomatic and hybrid warfare strategy towards NATO. It is intentionally provocative propaganda theatre, designed to gauge NATO’s willingness to respond. And that willingness has been lacking. NATO is simply not what it used to be. While there are promising signs of cooperation between European powers on conventional military issues, the United States is gradually being drawn apart from its NATO allies. Merely adopting sanctions against Russia has required an unrelenting political struggle, and even that has an uncertain future. The European far-right is ascendant and, except in Poland, far cozier with Russia than before. The eastern flank of NATO is willing to confront Russia, but the core members have their own problems and are reluctant to be drawn into disputes. NATO’s response to the invasion of Crimea and the destabilization of Eastern Ukraine has been focused on protecting allies from a repeat episode, but even that commitment is weak and uncertain. The INF violations add a new dimension to this dynamic; the missiles threaten Europe, but the treaty is the business of the United States; NATO powers seem mostly unconcerned by Russia’s actions. In justifying their violations by pointing to alleged American violations and missile defense plans, Russia can drive another wedge between the U.S. and Europe; the immediate impression is that Europe is under threat because of the U.S. pursuit of its own security interests. The U.S. cannot act without a consensus lest it provoke backlash from NATO, and even collective action will be propaganda fodder for Russia. Inaction, as with Ukraine, will only provoke further Russian misbehavior. The current American strategy on INF is hopelessly counterproductive. Simultaneously, it is attempting to draw Russia into compliance through diplomatic pressure and to develop and threaten to deploy a system that violates the treaty and matches Russian capabilities. This is obviously modeled on the strategy pursued in 1979, but another dual-track solution simply will not work. An aggressive response, threatening to violate the treaty, will give Russia a perfect excuse to avoid negotiations and will not lead Russia to admit its own violations. Diplomatic overtures will only embolden Moscow and make a retaliatory deployment less effective since it will be seen as the transparently obvious bargaining chip that it is. The immediate goal of the United States must be to make INF violations a unifying issue for NATO and establish a consensus within the alliance. This is easier said than done; it returns us to questions of NATO’s cohesiveness overall, but if current trends of rearmament and enhanced perceptions of the Russian threat continue, it may be narrowly possible. Only then, can the U.S. pick a strategy and pursue it to the exclusion of the other. Neither is ideal; diplomacy alone simply has not worked against Russia recently, and a retaliatory deployment will provide a decade of fodder for the Russian state media and diplomatic corps. However, if the current dual strategy wins out, the only likely outcome is a failure of diplomacy, the total collapse of the treaty on both sides, and the absence of any leverage to bring Russia back to the table. A mutual deployment is no longer an undesirable scenario for them, and they will never back down if it might be perceived as yielding to diplomatic pressure. Fortunately, the U.S. has a ready-made breakout capability for intermediate-range forces, and has other upcoming capabilities that could respond to Russian deployments; and this is abundantly clear to Russia. Work on the Long-Range Standoff Weapon, a new air-launched nuclear cruise missile, is already ongoing — it could be forward-deployed to Europe for air use, or potentially adapted for ground launch. Funding has also been put towards the development of new sub-strategic nuclear weapons for naval use, and with somewhat more effort, a new missile along the lines of the Pershing II could be deployed. The approach to INF negotiations must be sequencing, not simultaneous action. The initial emphasis should be on unrelenting pressure over Russian violations, followed by an attempt at negotiations and signaling of willingness to clarify the alleged U.S. violations of the treaty. Previous statements have already hinted at a retaliatory deployment, and the 2019 NDAA contained a non-binding endorsement for such a move, but this should be de-emphasized in negotiations. Development efforts should continue, in coordination with general NATO efforts on precision strike and air/missile defense – simply matching Russian capabilities will require several years of work. An actual deployment of infringing systems should take place only if negotiations stall completely, and only after the formal abrogation of the treaty. Efforts at negotiation after that point should not come immediately — they will only be successful if Russia perceives a retaliatory deployment as a major military threat, not a diplomatic ploy. Considering the strategies followed by each side, the results of these tensions could not have been otherwise; the treaty was a dead letter as soon as Russia decided that it no longer served a purpose. Yet, whether to inform arms control in the future or simply for posterity, we must recognize that things could have been different. Posted in World and tagged Nuclear Weapons. Bookmark the permalink.